Hello, 21st century! We're finally catching up! A radio/stereo keeps this secondhand iPod charged for dinner music. 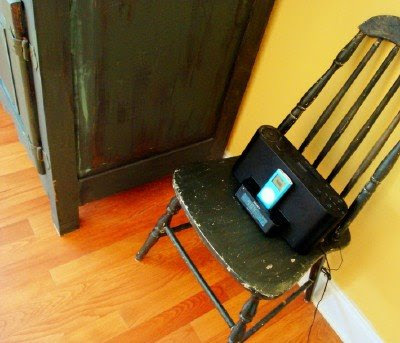 An odd chair makes a handy, use-what-you-have stand. I love to use what I have. Case in point...my bedside table is an OLD (very old) wood hight chair. I keep a lamp on the tray and the seat holds my Bible. Makes a cute table. As I am in the day care business I love having this chair in my room.It makes me smile. I like it. I love the blend of the old and the new. Whatever works! I have a similar chair that serves as an easel for a framed picture. When an extra chair is needed, one can always move whatever is on the chair! Bonus. Use it up, wear it out, make it do, or do without. This is our mantra. Way to make it do! Do you like your stereo? How is the sound quality? I don't have one yet because Steven bought me an FM transmitter for my iPod, so I can just tune any radio in the house to a set staticky station and play it, but I've been interested in the speaker systems. Hee! You're ahead of me! I don't even have an Ipod....our dinner music comes from an old boombox. But, it works. I just found you and love your blog. Will be visiting often. Thanks for sharing. PERFECT SHAPE - WONDERFUL DEAL! For dinner music we have been using the Pandora.com station (free!) that my husband set up. It's fun how putting in one song will pull up others the program finds as similar. So far it is about 90% accurate to our tastes. Love the repurposing AND multi-use. We moved recently and after I put all the must-haves in place I have been going back through the leftovers every time I find I need something and it's amazing that so far all our needs have been filled with what we already own. Probably means I need to have a garage sale sooner or later!